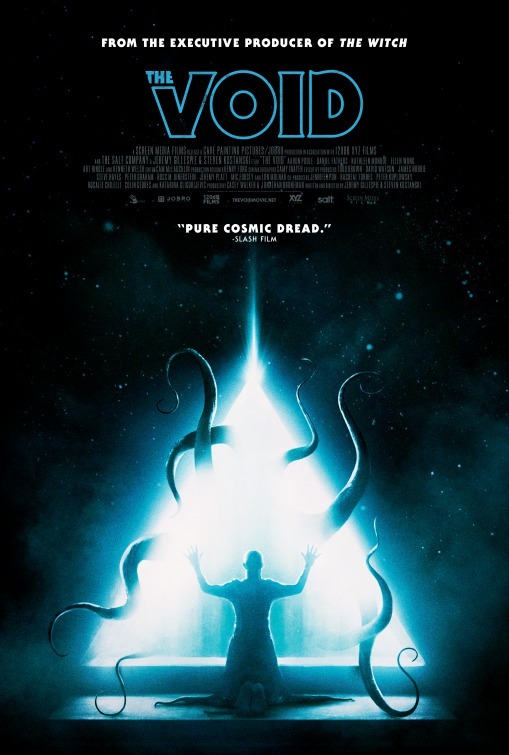 A wicked throw back to 1970's visceral horror with blood, cults, monsters and nastiness, THE VOID is sheer delight of the "that movie f-ed me up and I don't ever want to see it again-what time is the next showing" sort. I have no idea how to explain the plot without revealing too much-a cop brings an injured man to a hospital that is closing and then things go south as everyone is trapped inside by robed figures...only to have things go real weird. Dream like logic, and gore collide with practical effects and strong dose of WTF to create a film that deeply disturbed me pretty much from start to finish. I sat staring at the screen squirming in my seat afraid of where this is going. The fact that the film twisted several times in ways that make perfect sense made the film more unbearable to watch. This is one of the best horror films I've seen this year and it's nostalgic feeling made me fall deeply in love with it's blood soaked nastiness. Only an unnecessary coda remains a spot on an otherwise frightening film. Echoing any number of films from the last 40 years THE VOID takes the best parts and refashions them into something that seems old but is entirely knew. I could guess that the film has homages to John Carpenter, David Cronenberg, George Romero, Don Coscarelli and Clive Barker and I might be right ...but I could also be wrong since the film is not full on homage or rip off but merely an echo. Ultimately the film can be said to be like other films, but ultimately it is it's own thing.